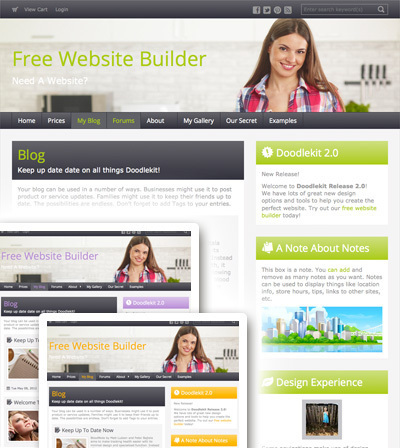 I rolled out a new group of nine templates yesterday created with Doodlekit's free website builder called 'Business'. The core color I picked was a corporate, dark blue. I then added 9 different color combinations to provide different variations of it. Everything about it is professional, simple, clean and very business looking. I added some minor gradients to give it a little 'flair'. You can click on the image to the right to see the template in action. Take a look and see if you like :). Feel free to post any comments here about these new templates or any other template ideas you may have.